If you love to create feminine and elegant outfits, then you should continue to read this article. Today I want to share with you chic and stylish lace pencil skirts that look adorable and gorgeous with high heels and flats, ruffled blouses and casual t-shirts. But, of course, you need to think about color for your new item. So you can choose a classic white or black ones, but if you want something eye-catching, you can pay an attention to turquoise or orange ones. Right now I offer you to scroll down to see all ideas. 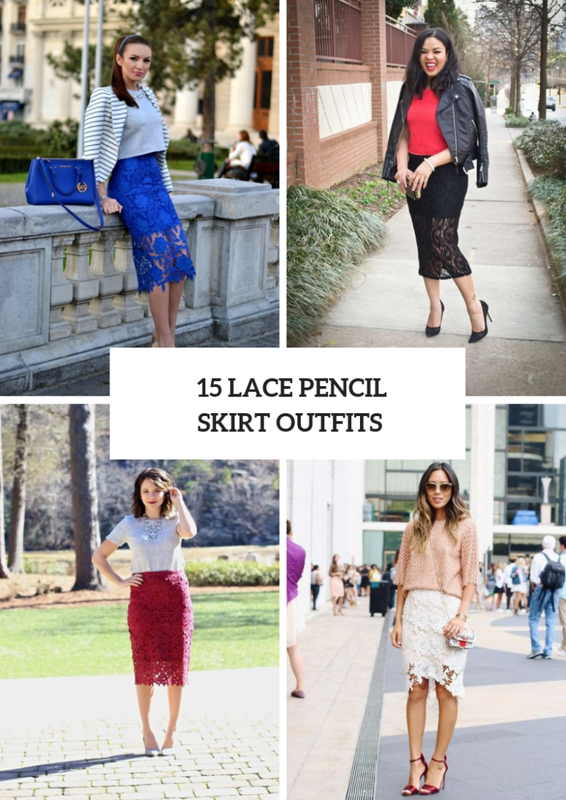 From my point of view, lace pencil skirts look wonderful with loose shirts. For example, you can take a white loose sweatshirt and combine it with a white lace pencil knee-length skirt and beige patent leather pumps. Or you can choose a peach loose sweater and mix it with a white lace pencil skirt, a chain strap mini bag, oversized sunglasses and red satin ankle strap high heels. Wanna something casual? Then you can try to repeat a combination with a denim button down shirt, a white high-waisted skirt, a pale pink leather waist bag and beige shoes. Or you can pair a gray sweater with a midi skirt, a leopard clutch and flats. A combination of a lace and leather is a classic one, so you can take a red shirt and mix it with a black lace pencil midi skirt, a black leather jacket, an embellished clutch and black pumps. One more cool everyday look is an outfit with a pale pink shirt, a black and white floral bomber jacket, a white lace skirt and white ankle strap shoes. For those who want an elegant look, I offer to pair a white button down shirt, a light blue knee-length skirt, a light blue maxi coat and beige pumps.